Now this is a post I have been wanting to do for a while. 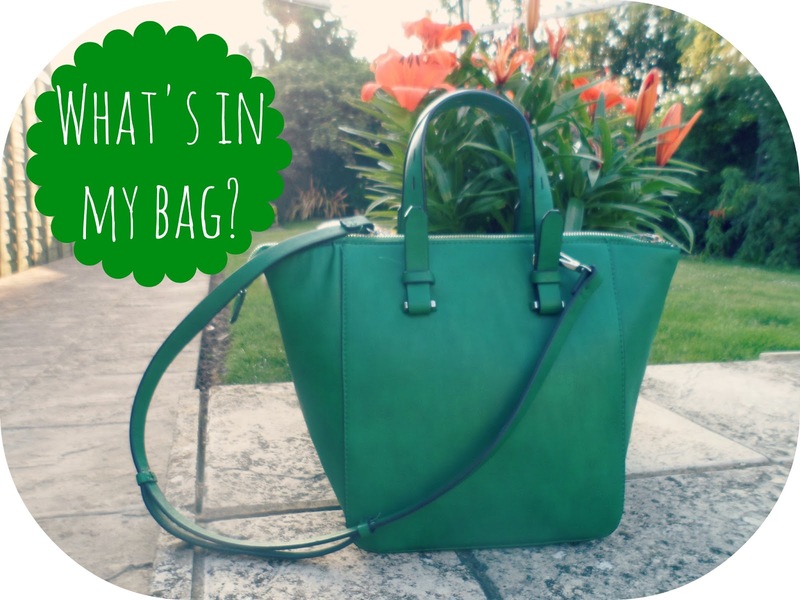 My bag is from Zara and is the green mini shopper - if you have been on my blog recently (thank you) then you would have seen it in my June Favourites post! I love it and even though it's called the "mini" shopper, it isn't mini at all! I like to carry a lot round with me and this bag is perfect! It fits in so so much and doesn't look ridiculously big, it is actually the perfect size for me, and it was only £22.99 - a Barry Bargain some might say! Cath Kidston Umbrella - Clearly living in England this has to be up there with the top things to carry around with you! I think this was a limited edition one for the Olympics last year, I got it for Christmas and love that it is so compact! Soap & Glory Hand Food - The best hand cream ever, so nice to have it with me all the time. My iPod - This is my first and only iPod I've ever had - it's doing me well! It is the 120b silver classic and holds soooo much, I have thousands of songs, Tv Shows, Movies - I wouldn't ever buy any other iPod other than a classic. My Phone - I love this badboy and don't go anywhere with out (man I sound sad but I bet you are all the same!) It is the white iPhone 4S , my contract isn't up until March next year so will have it for a little while longer yet! Half a packet of Polo's - I like to have these in my bag to keep my breath fresh! My Kindle - This was mentioned in my Colours Of The Rainbow Tag post. I love reading so when my boyfriend bought me a Kindle out of the blue I was so excited! I got this case from TruffleShuffle.com as I (obviously) love the Wizard Of Oz and thought it was so cute! 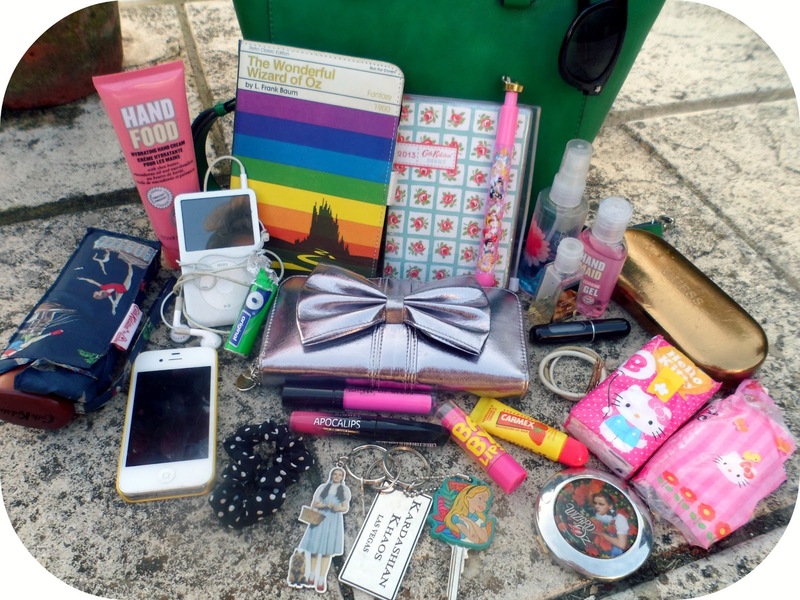 My Purse - Can't go anywhere without this badboy! My purse is a metallic pewter FCUK wallet with a bow detail! I got it from ASOS a few months ago and it's so handy, lots of card space and zip pocket! I'm the sort of girl who changes her purse alot, I alwasy want to buy a new one! 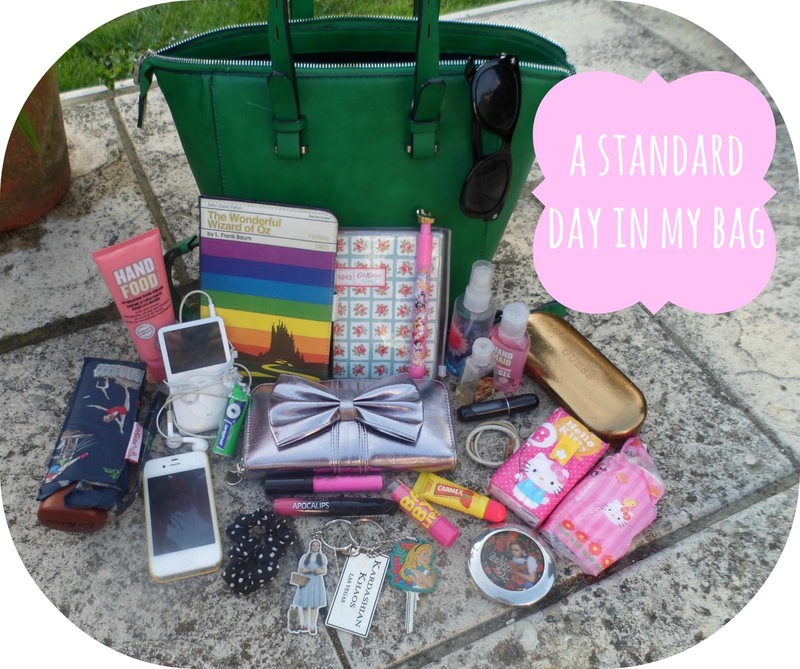 Diary - I always have this in my bag, it is the Cath Kidston small 2014 diary and it is perfect, week per page and lots of spaces for notes too! Princess pen - ...to write in my diary... duh! Got this at Disneyworld last year! Keys - I don't drive (I know I'm a loser!) so I literally only have my house key which is on a cute Alice In Wonderland thingy and I also have my Dorothy keyring (do you see a theme?) and my keyring from Kardashian Khaos in Vegas! Pink Chiffon Body Spray - I mentioned this in my May Favourites it is from Bath & Body Works (so I can't get it easily in the UK :( ) and I love the scent so much, brings back amazing memories of being in America aswell everytime I spray it! Glasses - I probably don't wear these enough but I carry them round with me 24/7 anyway, they are by Guess. I'm kind of bored of them now and when I can afford some new ones I'm going to change my frames to something a bit cooler! Hairbands & Grips - A girl always needs these in her bag. Hello Kitty Pocket Tissues - just a given, why wouldn't you carry tissues around with you?! Pocket Mirror - Wizard Of Oz themed once again (I always get bought these things for xmas and birthdays :) ) Always handy to have a mirror with you! Sunglasses - These are from River Island but sold on ASOS and were only £2 in the sale last year - bargain! love that bag! that wallet is adorable as well!